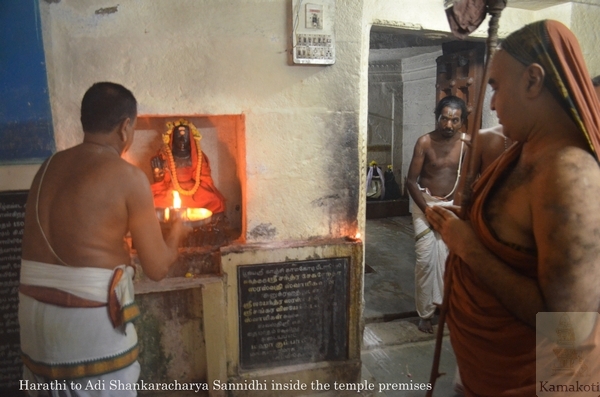 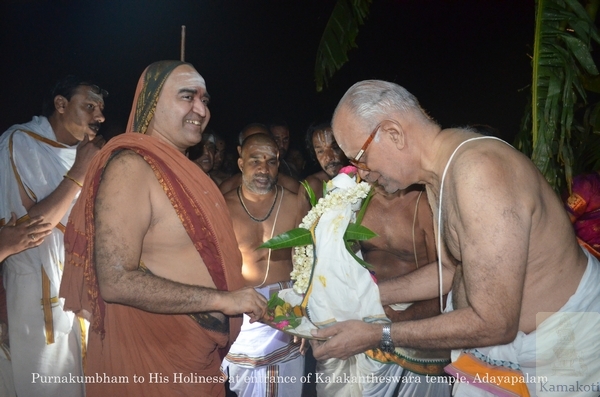 His Holiness Pujya Shri Shankara Vijayendra Saraswathi Shankaracharya Swamigal started from Kanchi after the Vishwaroopa Yatra and reached Adayapalm village at 8.45 pm. 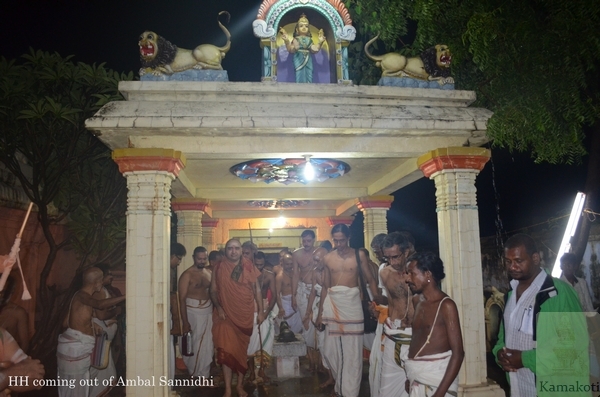 Enroute, devotees in Arcot received His Holiness and paid their respects. 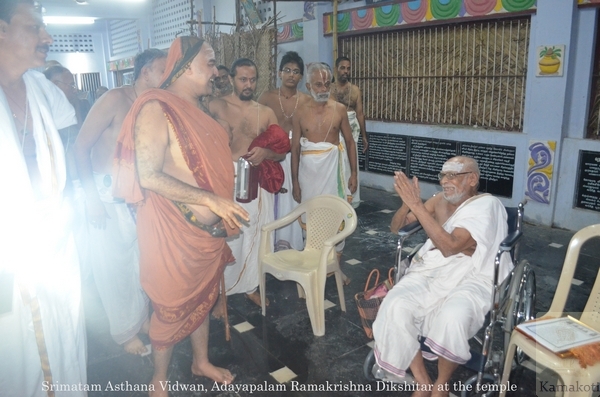 His Holiness was received with Purnakumbham by devotees belonging to Adayapalam village led by Justice Shri Ratnam. 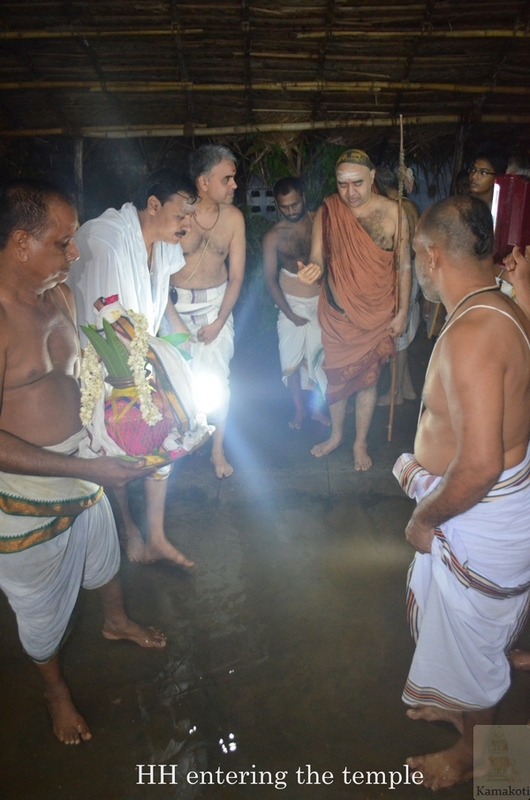 There was continuous rain from the evening and slightly drizzling when His Holiness entered the village. 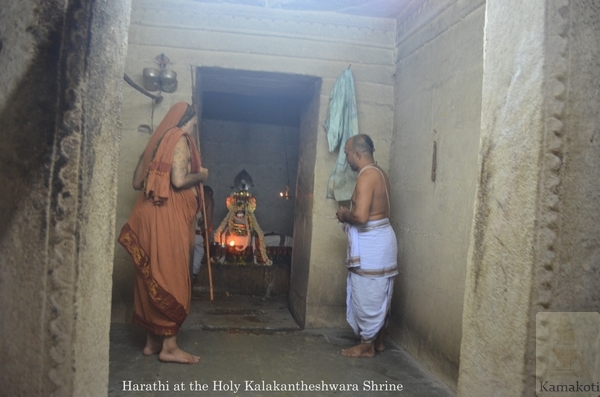 Vishesha Harathi was performed at the ancient Kalakantheshwara & Ambal shrines. 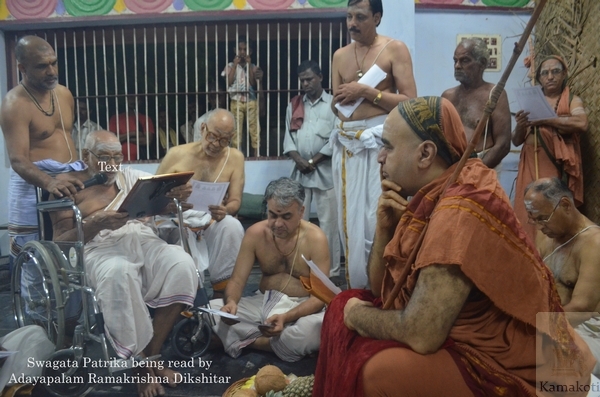 After darshan at the temple His Holiness was received with Swagatha Patrika read by Srimatam Asthana Vidwan Adayapalam Shri Ramakrishna Dikshitar. 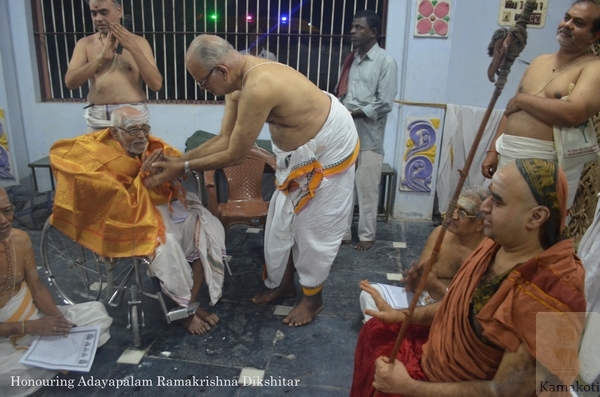 The nonagenarian scholar (93 years old), a native of Adayapalam village, and belonging to 11th generation of Appaya Dikshitar Vamsha had come to welcome His Holiness despite his advanced age. 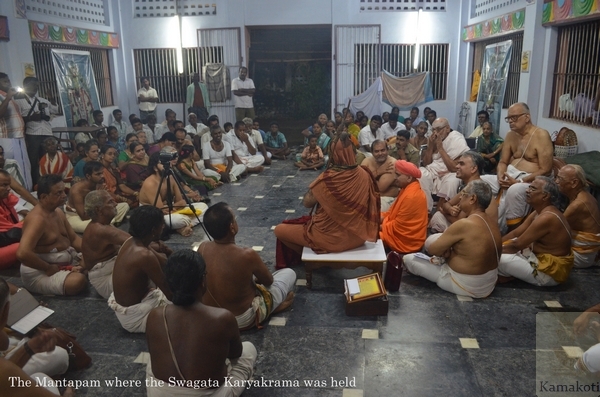 The swagatam was read in Sanskrit. 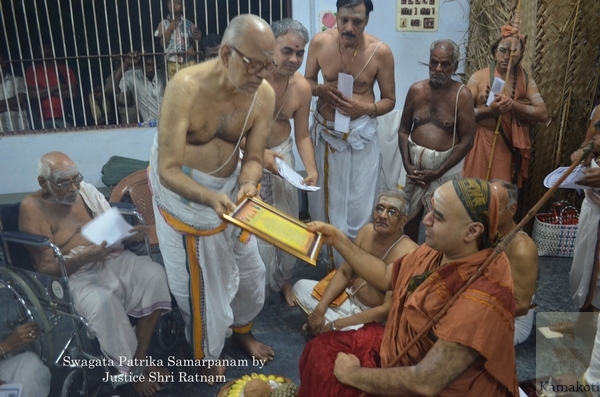 Justice Shri Ratnam (Former Governor & Retd Chief Justice of Himachal Pradesh) submitted the Swagata Patrika and Shri Mani submitted shawl & fruits to His Holiness on behalf of the devotees. 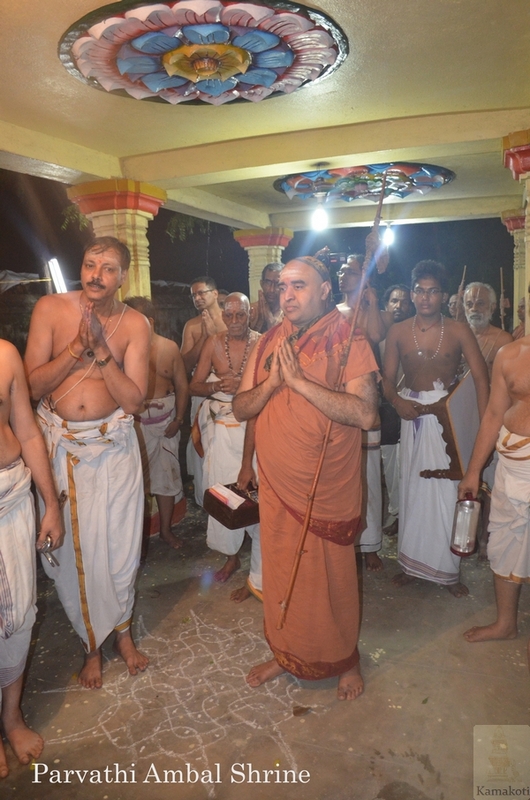 Many of those belonging to Appaya Dikshitar Vamsha were present. 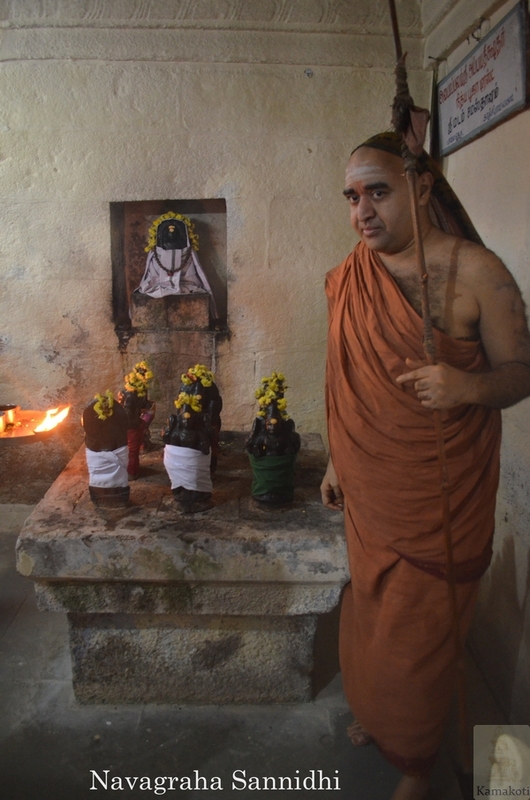 Incidentally it was Appaya Dikshita Jayanthi yesterday and the villagers were happy that His Holiness arrived on this day. 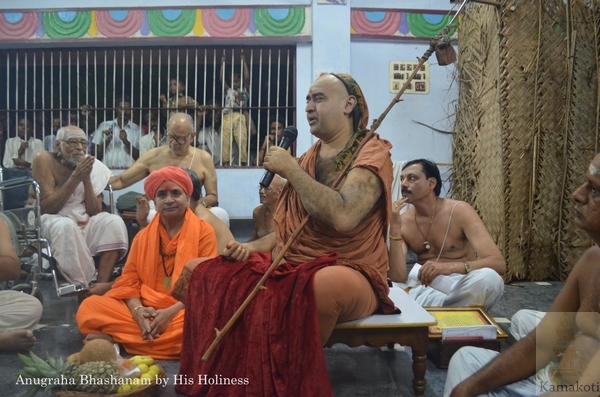 His Holiness gave Anugraha Bhashanam wherein HH spoke in length about Appaya Dikshitar' s contribution in strengthening Vedic & Shastric studies and blessed prasadam to the assembled devotees.